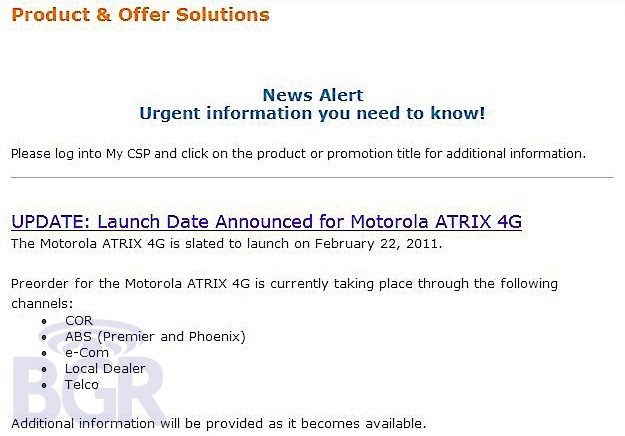 A few weeks ago AT&T revealed that the Motorola Atrix 4G would be on sale from March 6th, but according to BGR's sources the netbook-smartphone hybrid may be launching as early as February 22nd. The earlier announcement also indicated that this highly anticipated phone would cost $200 with a two-year contract and $500 in total with the dock (if bought separately, the phone would cost $200 and the dock would cost an additional $500). Early reviewers aren't exactly huge fans of this novel, albeit flawed device. The reportedly sluggish performance doesn't justify the excessive price of the dock. However, there are some positives, such as a long-lasting battery, blazing fast performance and lots of RAM!